The Governor of the Central Bank of Nigeria (CBN), Mallam Sanusi Lamido Sanusi, yesterday foreclosed the possibility of returning the five banks whose management teams were recently sacked to their former majority owners, saying the era of running banks as sole proprietorships was over. This came hours after the banking watchdog said it will put out of circulation the current N5, N10 and N50 notes, which have now been replaced with polymer – a plastic material made from petrochemical products – by the end of March 2010. Speaking at an interactive session with the capital market community on the floor of the Nigerian Stock Exchange (NSE), Sanusi also said the results of the audit of the remaining banks would be made public early October 2009. CBN had on August 14 sacked the managements of five banks – Afribank, FinBank, Intercontinental Bank, Oceanic Bank and Union Bank – over the huge non-performing loans of their banks and other alleged financial abuses. The apex bank also injected N420 billion into them, saying lax governance had left the five banks undercapitalised. Thereafter, it appointed new helmsmen into these institutions to stabilise and make them attractive for core investors. Explaining the actions taken in respect of the five banks, Sanusi said that for now, the CBN had not offered them to any investors. The CBN governor said shareholders of the banks would be carried along whenever the time comes for them to be sold. “Even when we have rights under the laws, we have chosen to use them responsibly. When there is a conflict between Banking and Other Financial Institutions Act (BOFIA) and Companies and Allied Matter Act (CAMA), BOFIA reigns supreme. However, the CBN is very concerned that there are many people who have bought shares in the banks and who have nothing to do with the conditions that the banks are and who must be treated in fair and transparent manner in everything that we do. We will no treat shareholders unfairly and we will go through all the processes we need to go through before any change is made. But we will not allow the institutions to fall back to the scenario they were before,” he said. Speaking on margin facilities granted by some of the banks to capital operators, Sanusi advised banks to stick to any repayment arrangement made before the banking reform commenced. Stockbrokers had told him that before the five CEOs were sacked, they had entered into restructuring agreements with banks to repay their loans over a certain period of time, but that the take-over of five of the banks has necessitated some of these banks to renege on the agreements. Sanusi said he did not ask anybody to go after any stockbroker. “How the banks organise with their borrowers to recover their money, whether two years or more the CBN will not dictate. If anybody tells you that I said go to that broker and recover your money, that one I did not do. What we said is that the banks should make provisions for the facilities that have depreciated due to the losses in the market. “What we are saying is that make the necessary provisions and recognise the losses. If the market bounces back, take the profit. But for now recognise the losses. However, you can understand the pressure they are under and they have shareholders and they have made losses. The only way to minimise their losses is to accelerate recovery,” he said. However, Sanusi blamed some of the banks and stockbrokers for the huge amount borrowed for stocks trading. 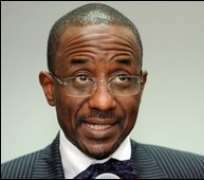 Sanusi, who said that the failure of all regulators in the financial system partly led to the current problems, added that the primary focus should be the lessons so far learnt from the incidences that led to the sack of the CEOs of the five banks and the fallout. “For us all, what lessons have we learnt from the situation? I mean the CBN Securities and Exchange Commission (SEC), NSE and the brokers. What changes are we putting in place to make sure that these mistakes do not happen again? Going forward, there should be more collaborative efforts among the regulators,” he said. The CBN boss said that contrary to reports, foreign banks are still dealing with the five banks, adding that credits lines of the latter have not been withdrawn. Meanwhile, the chief executives of the five banks have assured Nigerians that the loan recovery efforts are on course. The CEO of Oceanic Bank, Mr. John Aboh, said so far N20 billion has been recovered. Similarly, the CEO of Afribank Nigeria, Mr. Nebolisa Arah, disclosed that N20 billion had been recovered, while FinBank Plc, according to its CEO, Mrs. Suzanne Iroche, had recovered N5.5 billion. The CEO of Intercontinental Bank, Mr, Lai Alabi said a total of N29.6 billon had so far been recovered. On her part, the CEO of Union Bank, Mrs. Funke Osibodu, said the bank targets 35 per cent recovery before the end of the year, saying about 10 per cent had been achieved. Meanwhile, the current N5, N10 and N50 notes billed to be phased out by the end of March 2010 will be printed in polymer and put in circulation from September 30 this year after a formal launch by President Umaru Musa Yar'Adua. The new notes will circulate side by side the old notes for six months when the latter will cease to be legal tender. Sanusi said that the apex bank will from today commence sensitisation of the public on the new notes across the country, using various medium of communication. He said the notes have retained their current sizes, designs and other key elements, adding that the watermark has been replaced with the transparent window and G-switch which turns from green to gold when the note is lifted. The Governor said 1.9 billion pieces of the new currencies are ready for circulation, having been printed by the Nigerian Security Printing and Minting Company and a foreign printing firm. The CBN had in 2007 during the tenure of the former Governor, Professor Chukwuma Soludo, launched currency reforms. The first phase was the conversion from paper to polymer. The currency reform was meant to address the convenience, security, durability and cost effectiveness of the naira. Only the N20 note was converted that year.